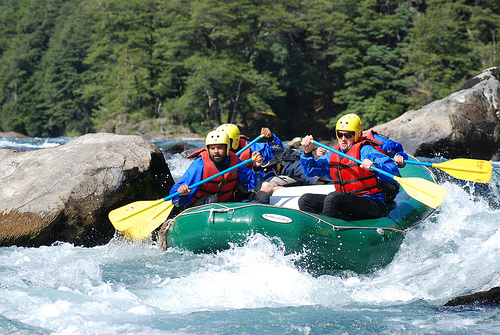 White water rafting is a highly popular activity in Argentina and the ultimate way to combine thrills with nature. Each river has its own unique qualities, whether the degree of difficulty, the scenery and landscapes, or the quantity of water you can expect to catch in your raft. But regardless of which you choose, a good time is inevitable. A class ranking from I-VI is used to measure the level of difficulty in rafting, with class I signifying totally flat water and class VI a river run with obstacles, rapids and dangerous elements that make it a choice for experts only. Rafting operators in Argentina will provide the necessities for the ride including paddles, helmets, lifejackets, splash jackets, wetsuits and of course, your guide. The guides are well experienced rafters who know every detail of the specific part of the river that they guide, and they will direct each and every movement that is made within your raft. So as long as courage is in supply, a good time is bound to be had my all. Depending on where your travels take you in Argentina you will be able to consider some or all of these options to choose from for a river rafting experience of a lifetime. This page rendered in 0.234 seconds.